Google India has started a holistic campaign, keeping into mind the next Parliamentary Elections 2014 in India. The Campaign as such is called as Google Politics & Elections which will act as Elections hub to study, watch, discuss, participate in digital campaign trail of various participating agencies such as Election Commission, Political Parties and Ordinary Voters. Google India started the project with the video featuring Mr. Shyam Saran Negi, – oldest voter in Himachal Pradesh & Independent India’s first-ever voter. Mr. Negi lives in picturesque village called Kalpa, located at an altitude of 10,000 feet, in Kinnaur district and he wants no Indian to miss out on the coming electoral battle as he has never missed to vote since 1951. Google India has this Link where voters can Pledge to Vote with a message and as along with the Pledge can check latest Trends of Political Parties. We hope, India’s 81.45 crore electoral population will choose a fair and stable government who will try to increase the Tourism, spread the Incredible India brand overseas and make policies & infrastructure for the betterment of Tourism in India. Happy Voting & Happy Travelling! In Hinduism, Twelve (12) temples called Jyotirlingas are dedicated to Lord Shiva. Also Called as Jyotirlinga, Jyotirling or Jyotirlingam the literal meaning of the word is : Jyoti means ‘radiance’ and lingam the ‘mark or sign’ of Shiva, Jyotir Lingam thus means The Radiant sign of Almighty. May Lord Shiva bless all people of the world on the auspicious occasion of Maha Shiv-Ratri! Banned in the past due to privacy concerns, Google has now come up with 360-degree panoramic imagery of 30 monuments. On premièring this service, union minister of culture Chandresh Kumari Katoch said “Today, this partnership with Google makes it possible for billions of people across the world to see and explore our magnificent heritage, to take a walk at the Rock Cut Jain Temple, to marvel at the Nagarjuna Konda Buddhist Stupas and to relive history in Fatehpur Sikri. With the release of these new panoramic images, we aim to create a dynamic, immersive online experience by which people within India and around the world can understand and engage more of India’s diverse cultural heritage”. Google had signed an MOU with the Ministry of Tourism, India to map 30 monuments using its ‘Street View Trekker’ technology for the first time in India. As the special Google cars cannot enter into the Taj Mahal, it is instead being mapped by a backpack Trekker 75 Mega Pixel camera specially designed by Google. Many other websites already provide virtual tours on net, like this one. Here’s a video bringing you through Google Maps Street View to the Taj Mahal. The Image stood first in Wiki Loves Monuments India 2013 contest. Situated in the city of Thanjavur in Tamil Nadu, The Brahadeewarar temple, is a Hindu temple dedicated to Lord Shiva. The temple is also known as The Peruvudaiyar Kovil, The Big Temple , The Brihadisvara Temple, Rajarajeswara Temple and Rajarajeswaram. Built by the great Chola King Raja Raja 1 (985 -1012 A.D), the temple complex is an architectural excellence of ancient India. Statue of Rajaraja Chola at the Brihadiswara Temple, Thanjavur. Brihadeeshwara temple is the best example of excellent Chola architectural and engineering skills, finest contribution to Dravidian temple architecture and it has stood the testimony of time with its magnificent central dome; The 64. 8 Mt. tall vimanam (tower over the sanctum sanctorum) is a great attraction for one and all. It has been notified as India’s most prized architectural sites and it has been part of UNESCO World Heritage Site and Great Living Chola Temples. The temple has gigantic “Mahalingam” in the shrine, measuring 4 meters in height. The second largest Nandhi in India, a monolithic Nandhi chiselled out of a single rock is also facing the sanctum. The Great Nandi facing temple. The entire temple is made of granite and it is the first complete granite temple in the world. The granite stone quarry is not available surroundings of the city, It is not known where this massive granite was brought from. All granite temple: The Brihdeeswarar Temple. Second gopuram of Brihadeeswarar Temple, Thanjavur. The most widely belief about this temple is that at noon the shadow of the temple disappears. The Brihadeshwar Temple is One of the outstanding temples in South India and as widely believed it is so designed that 14 tier pyramid shaped vimanam never falls on the ground at noon during any part of the year. This picture was taken from the left corner of the temple (behind the temple). The staircase which is small in picture will lead you to darshan of God Dakshinamurthy. The Brihadiswarar temple is one of the rare temples which has idols for “Ashta-dikpaalakas” (Guardians of the directions) — Indra, Agni, Yama, Nirṛti, Varuṇa, Vāyu, Kubera, Īśāna – each of whom was originally represented by a life-sized statue. However, only four out of eight -Agni, Varuṇa, Vāyu and Īśāna are preserved today. Thanjavur can be reached easily by road, rail and air. Hence, tourist can come and watch this true Architectural excellence of ancient India. 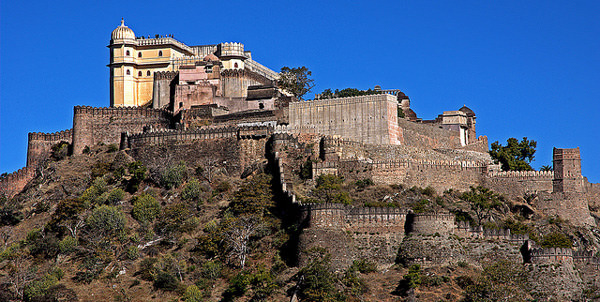 82 km northwest of Udaipur lies the most important fort in Mewar after Chittaurgarh- Kumbhalgarh. This city is known for its history and wildlife sanctuary and it is located in the Rajsamand District of Rajasthan. Kumbhalgarh has the second largest continuous wall on the planet and can be simply refer to it as “The Great Wall of India”. These most-remarkable walls of fort stretches across 36 kms of the Aravali Mountains. Like most interesting part to any Rajasthani fortress is the associated folklore or legends mix with history and Kumbhal-garh is nothing short of it. In 1443, when the king started the construction the structure eventually crumbles to ruins by the sunset until a spiritual preceptor address the king to offer human sacrifice but voluntarily done. The king sent out word, but, as can be expected, no one volunteered. But one day, a pilgrim (also considered to a soldier from the commandment) volunteered and been ritually decapitated. The sacrifice was necessary to ensure that the battle walls being constructed by Rana Kumbha would be strong enough to withhold the sieges. Today the main gate of the fortress, Hanuman Pol contains a shrine and a temple to commemorate the great sacrifice. According to popular folklore, Maharana Kumbha used to burn massive lamps that consumed fifty kilograms of ghee and a hundred kilograms of cotton to provide light for the farmers who worked during the nights in the valley.